Appalachian Physical Therapy in Harrisonburg will be hosting an Artist Open House on Tuesday, April 3rd, from 7pm to 8pm. Come meet and enjoy photographs from local professional photographer Lynn Whitmore. Lynn is graduate of James Madison University where she majored in Biology. In 2015, she attended Lord Fairfax Community College and received a certificate in Nature and Wildlife Photography under the guidance of nationally known photographer Rob Simpson. Locally, her photos have been used in calendars and as catalog covers. She is also a major contributor to the town of Broadway website. 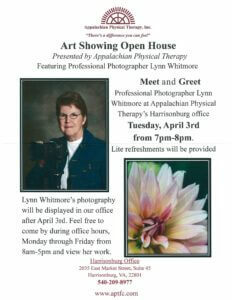 Lynn’s work will be on display at Appalachian Physical Therapy in Harrisonburg beginning on April 3rd. For those who are unable to attend the open house but would like to view Lynn’s photographs, you are welcome to stop by during office hours Monday-Friday, 8am-5pm. To view the event flier, click here.